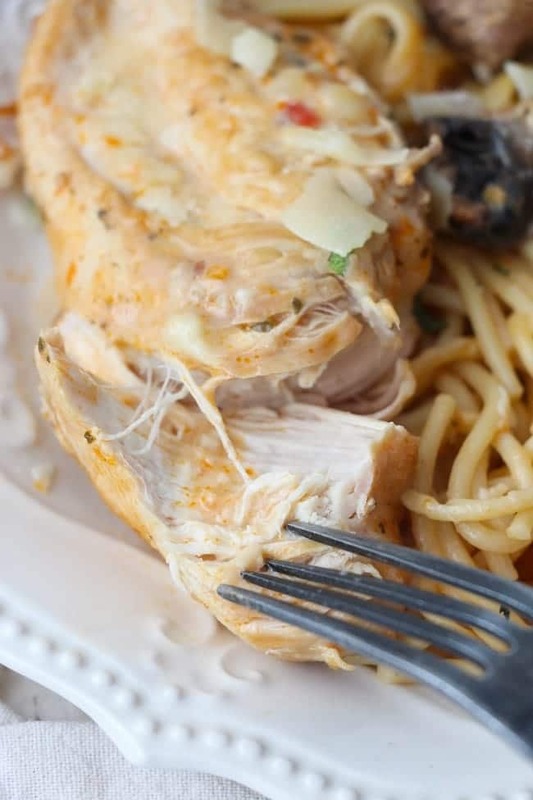 This Instant Pot Creamy Sun Dried Tomato Chicken Parmesan is an easy family dinner recipe the whole family will love. Served with a side salad and a slice of Italian bread, it’s a restaurant-quality meal you can effortlessly pull together on the busiest weeknights. 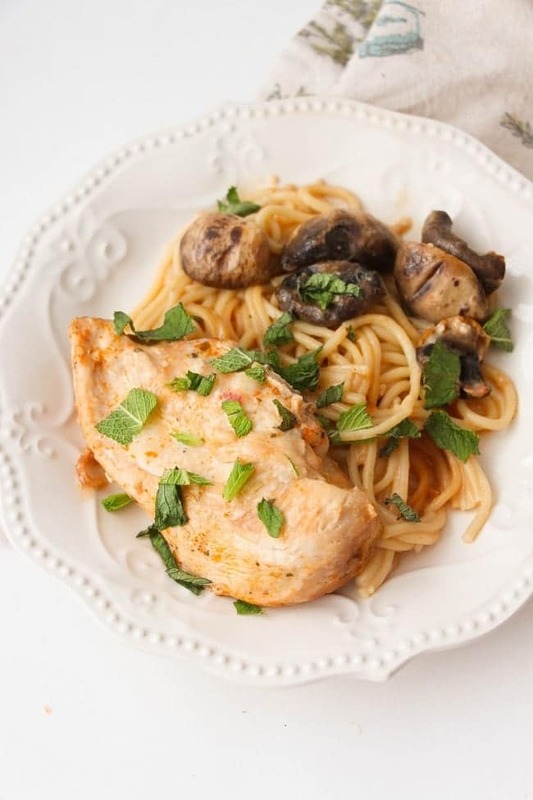 Add this to your arsenal of easy, family-friendly Instant Pot chicken recipes. It’s one you’ll use again and again! Like almost all of my recipes, this one for Creamy Sun Dried Tomato Chicken Parmesan is just a few simple steps. It’s hard enough to get dinner on the table every night. Why make it hard? Because this meal is made in the Instant Pot , this is a one-dish meal. So, not only do you save time and energy on making the meal, you have less clean up too! When people ask why I love my Instant Pot so much, a lot of it has to do with the saute function. Unlike a slow cooker or other pressure cookers, I can brown meat in the Instant Pot and have one less pan to clean. So, the first step is to brown the chicken in a little bit of olive oil. You’ll have to remove it to a plate before moving to the next step, but a plate is so much easier to clean than a frying pan! 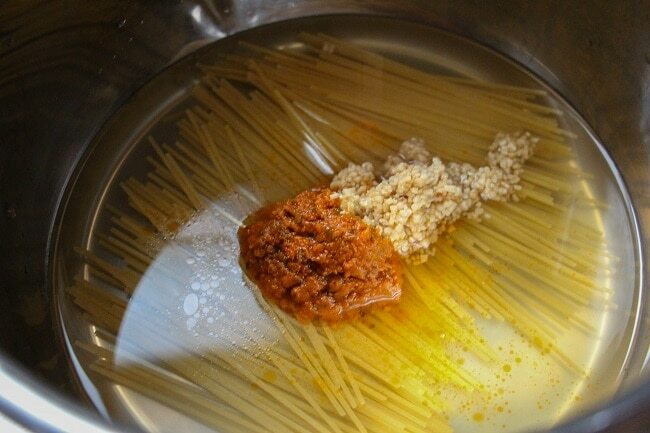 After removing the chicken and turning the Instant Pot off, add the liquid, spaghetti. sun dried tomato paste , and garlic to the pot. 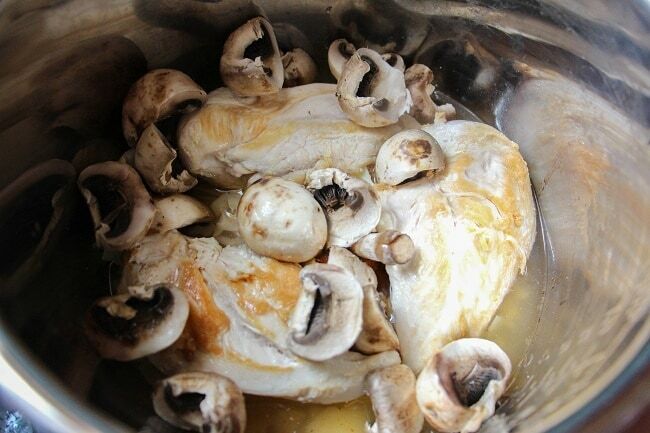 Place the chicken on top and then pour the mushrooms over the breasts. Cook on manual high pressure for 10 minutes and natural release for 2 minutes. 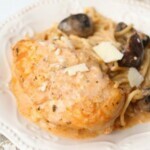 To make the sauce creamy, add the Parmesan and cream and mix well. Dinner’s ready! Top with some freshly shredded Parmesan and fresh basil for added flavor and visual appeal. Ready to cook? 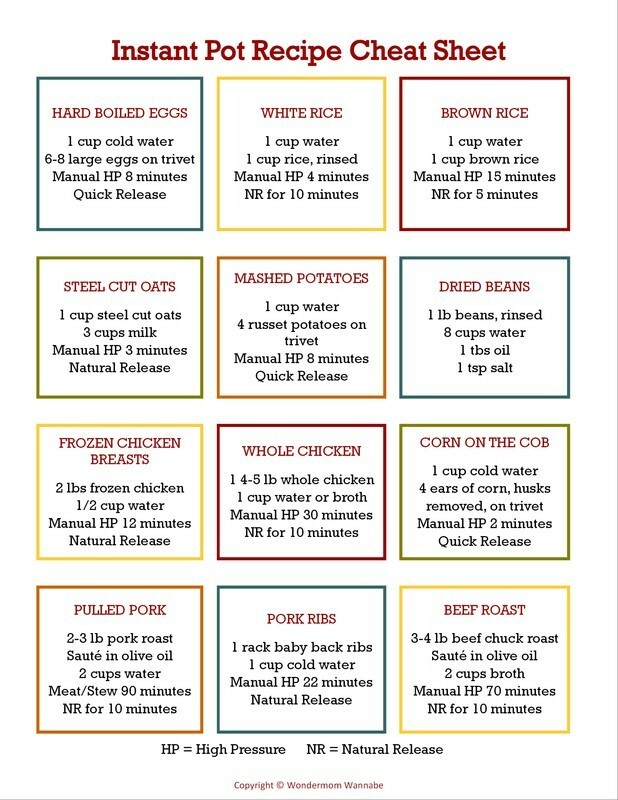 Here’s a printable version of the recipe with detailed measurements and instructions. Set your Instant Pot to saute. Wait for the display to read "Hot" then add the oil. Season your chicken breasts with salt and pepper and add to the hot oil. Brown for 2 minutes on each side and then remove to a plate. Turn off IP. 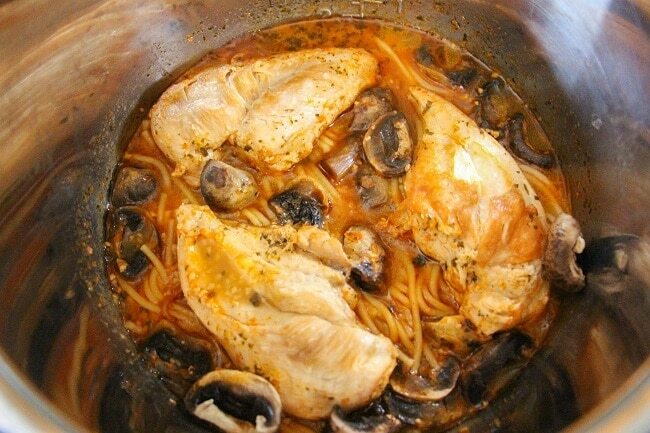 Add the broth/water, spaghetti, sundried tomato paste, garlic and mushrooms to the Instant Pot. Place the chicken on top and secure the lid. Select manual and cook for 10 minutes. Natural release for 2 minutes, then quick release. 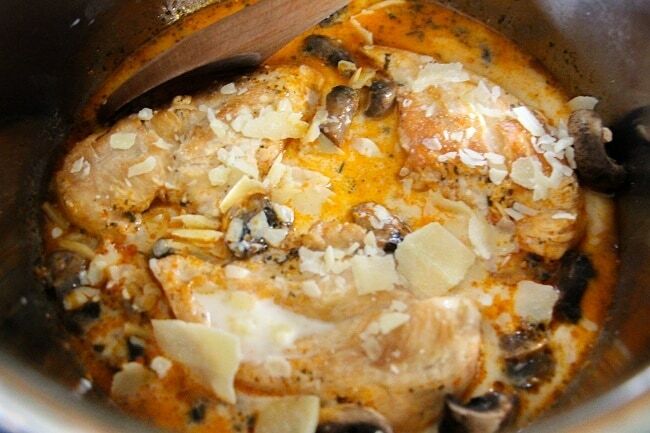 Quickly add the Parmesan cheese and cream, and stir into the broth to make your creamy sauce. Serve with additional Parmesan and torn basil. Is the sauce made with sour cream or heavy cream? The text of the post says sour cream, but the recipe just says cream. Thanks for asking since I didn’t notice the discrepancy until you pointed it out. It should be cream, NOT sour cream. I’m not sure what I was thinking about when I typed that. Fixing it now. Thanks again! Hello! I just bought my instant pot over the weekend and then found your site! I immediately made the French Dip Sandwiches and they turned out great! This week I’ve had 2 fails already though….I tried it with this recipe and the Taco Lasagna. Both attempts during the preheating the instant pot read ‘burn’ and neither recipe worked for me. I’m not sure what I’m doing wrong! Do you happen to have any ideas as to what I could be doing wrong to receive this message? Hi Bridgette, congrats on getting an Instant Pot! You aren’t the first person to get that error with the Taco Lasagna so I think I need to revise that for a more foolproof version. I think I need to add a deglazing step in that one and perhaps add some more liquid. I haven’t had burn complaints with this recipe though. When you say “during the preheating” do you mean while the pot is coming to pressure? Or do you mean after you’ve turned on “Saute”? I’m updating this recipe to make it clear that when you set it on saute, you should wait until the display reads “HOT” before adding the oil and chicken to brown. You shouldn’t be getting a burn error after this step since there is sufficient liquid in the pot for the pressure cooking stage unless you are using too much spaghetti (which would absorb all the liquid). Thanks for your questions! I’ll update the recipes accordingly to be more helpful and more clear.